The third annual Student Art Exhibit is now on display in the Hayloft Gallery at the Jacksonville Center in Floyd, Virginia. It includes work by adult and youthful students. 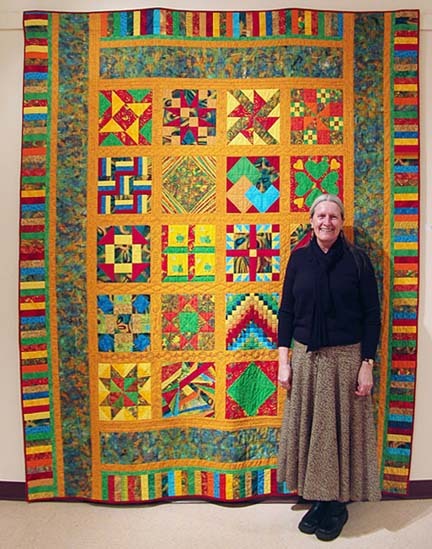 This 8×10 foot "Sunburst" quilt by Barbara Murray filled the South end of the Hayloft Gallery with light. 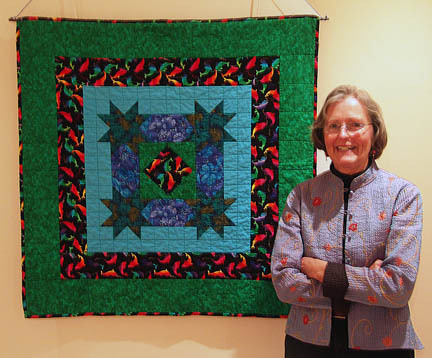 The equally striking "Quilt with Dolphins" by Sally Johnson held my attention immediately. The contrast of supple dolphin shapes and the angular geometry of the main quilt pattern was striking. Linneya Cooley executed one of the most appealing pieces in the show in my opinion. 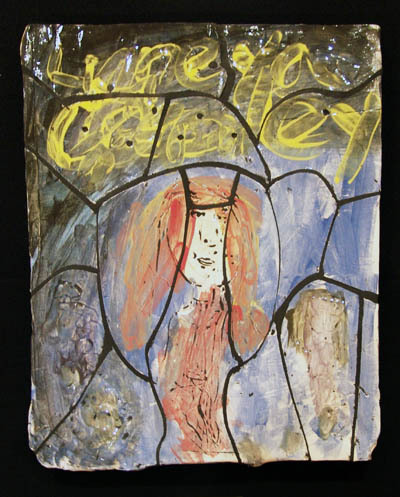 Her mosaic self-portrait conveys a universal message. Her artist statement says, "This piece of art has a spirit in it. The ghost is me." Linneya is 9 years old. The exhibit features the work of 27 students who have taken classes at The Jacksonville Center. The exhibit includes work done in class as well as work inspired by having taken a class. This exhibit will close January 26. Try to see it before it closes. This entry was posted in Floyd Artisans/Craftspeople and tagged Floyd County Virginia, jacksonville Center, student artists. Bookmark the permalink.